Historically, Buick was GM's "discreet Cadillac"--a high-end car without the high-end ostentation. For many years, Buicks were known as "doctors' cars" for just that reason. Ownership indicated you had money, but weren't looking to flaunt it. Over the years, Buick produced some of the most stylistically daring and physically impressive machines ever to come out of Detroit--or anywhere else. Of those notable machines, is the Estate wagon or Electra Estate wagon. These wagons served families across America from 1980-1990. Well it's time to pack up the kids and head out on a road trip! You and your family can relive those childhood memories while at the same time, providing your children with memories of their own. And what better way to do it, than in this 1990 Buick Estate Wagon. This 1990 Buick Estate Wagon was the last of its kind. The body style that had been popular for so many years was discontinued. Now these wagons have reached collector car status as many people look for these models once again. This particular car was ordered with ALL the bells and whistles. It has been well-maintained over the past 22 years. This is an ultra low mile original car in a model year some say is the last of the great Buicks. Here is the list of specification: - 1990 Buick Estate Wagon - 39,000 original miles - 307ci V8 - 4 speed automatic transmission - Dark Sapphire Blue - Woodgrain panels - Plush tan leather seats - Power steering - Power brakes - Power windows - Power locks - Power antenna - Power driver seat with manual recliner - Power passenger seat with power recliner - Power rear window - Power mirrors - Tilt steering wheel - AM/FM Stereo with cassette player - Electronic Touch Climate Control Heat/Air Conditioning - Twilight Sentinel - Lamp monitors - Cornering lamps - Two-way tailgate - Front seat reading lamps - Rear window defroster - Cruise control - Third seat - Luggage rack - Aluminum wheels with Buick center caps - Original owner's manual All the glass is nice and clear. Rides on a nice set of Uniroyal Tiger Paw tires. No exhaust leaks of any kind. The car is completely original down to the floor mats. The wood paneling is in great condition. Not faded like so many wagons of this era. The paint has a brilliant shine. The interior is free of tears. The headliner is not sagging. And the carpet shows very little wear. The 307ci V8 starts and runs well. The transmission shifts smooth. I can find no leaks from either. All of the options are in good working order. The car is truly a time capsule. Whether you are someone looking for a great, low-mileage driver or a collector looking for the last of a great model, I think you will find this car will easily meet your needs. Please email with any questions you may have. I plan on taking many more detailed photos today. To view larger versions of the photos, click on the link below. 1990 Buick Estate wagon - a set on Flickr When it opens, click on the photos. When the photo opens, click on the magnifying glass with the (+) sign in the top right corner. This will allow you to view the larger versions of the photos. The price is negotiable. Don't be afraid to make an offer. Not interested in any trades. Hello Everyone: It's Rich here again, and I'm still trying to track down by father's old '55 Country Squire. Evidently, no one on here has it! Anyway, I was looking around on the internet, and came across an organization out in California called "Woodies on the Warf." They have a big show every year (June). Has anyone been? What do you think? Is it mostly for those who actually own a Woodie, or can those just with a general interest in them have any fun? Is it worth making a trip to California to see it? Thanks! 61 Rambler wagon and 53 Packard Clipper???? This is a pic of our old family car, I believe a 53 Packard Clipper Deluxe. It has a portable carrier attached to the top. Can anyone out there verify or correct my assumptions???? thanks. Selling a 1957 Chevrolet 210 Station Wagon. Guaranteed to turn heads, Looks Like A Beauty, Runs Like A BEAST! Looks Great, Runs and Drives, Safe and Street Legal! 291 HP V8 Engine Electronic Ignition Powerglide Automatic Transmission Cosmetic Original Pieces Car is in between #3 and #4 Condition NADA Guide Puts it at 17,100 Edmunds.com Estimates Value at 19,000+ Exact Model Recently Sold Online for 29,999 Selling to Finance Future Endeavors, Looking for Serious Local Cash Buyer Price Negotiable, Looking to Sell Quickly! Contact EightZeroEight - 3Eight8 - 9Nine59 Or Email With your contact info to set up showing. Mahalo! 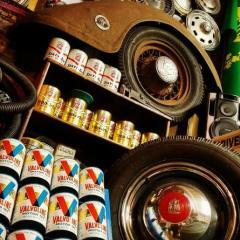 I have a large collection of parts from a 1955 Buick Century Estate Wagon that came from a parts car. Includes 4 doors, rear window, two sets of interior trim, air cleaner, spark plug wire covers, dashboard, Dynaflow transmission, rear end, gauges, and many more small parts. It would take two 1/2 ton trucks to carry it all away. I would prefer to sell all the parts to one good home, but if there is something specific you need we can negociate a good price. $3,800. For complete details and additional photos, email collectorcarsandparts@yahoo.com Delivery is available. Economy is bad, cannot continue restorations, have to let them go: to save us both some time: Prices are firm. email wwhitfield@triad.rr.com for pictures. 1957 chevy Bel air 4 door hardtop, in grey primer, needs complete restoration, needs floor pans, trunk pan can be patched and used. VIN# C57T272209, equipped with factory clock. No engine, Has automatic transmission under it, has generator, starter, head, intake manifold, will need a block. (It had a 283 V-8 engine with 2 barrel carb.) It was originally a yellow car. The stainless trim package fills the back seat. The section of the top bewhind the right rear door has had some patch work done already but it needs to be done again, properly. Rear windshield glass is good, front windshield will need replacing. $2250. 336-765-8312, Mocksville, NC 1957 chevrolet series 210 4 door sedan, original 283 V-8, powerglide automatic transmission, mileage is 82954. Body work has been done, body sanded and put in primer, have bumpers and stainless.f There is no rust on this North Carolina car and floor pans are good. Only one spot on floor pans had to be repaired. VIN # 14592284B, Car starts, drives, stops, has dual exhaust. $5500, 336-765-8312, or 336-782-4221, Mocksville, N.C. email for pictures. 1957 chevy 210 series 4 door 6 seat station wagon, with the orginal seats. 283 V-8 with 2 barrel carb and with powerglide automatic transmission,VIN # VB57B127520, equipped with radio and heater, 00224 on odometer, will need complete floor pans, windshield, rear glass and curved side glasses are good. $2250. 336-765-8312, Mocksville, North Carolina, :mad: 1957 chevy 2 door station wagon, over $10,000 has been spent in sheet metal/body work alone, plus NEW rubber for doors and windshield and new stainless steel brake lines, disc brake kit installed and power steering box installed, front suspension rebuilt, all come with the car! It is a rolling chassis, with all sheet metal work done. Body is ready to sand and paint. This station wagon has an excellent tail gate. Vin # A57T258493. The body was set off the frame, everything sandblasted. It has complete new floors installed, two new repair panels installed. It has an excellent tailgate. Repair pieces are not available for the tailgate. The owner of the restoration shop had to make those pieces. The only body filler on the whole car is a very small amount where the repair pieces of the tailgate were installed. My loss, your gain, first $6950. ALSO AVAILABLE to go with it for $2000 is a 1993 Caprice ex-police car with 135K miles and heavy duty suspension if someone wants to set the body onto a modern frame and running gear, VIN # 1G1B L5372dPW148124. 336-765-8312, Mocksville, North Carolina. Looking for a good original, or older restoration. want to drive and use, must not be a show car. I am in calif. What do you have? Well, I have exhausted my sources locally for interior parts...nobody wants to even try to tackle making me a new headliner for the '57 Buick Estate Wagon (Special) So, I am looking to the Buick community for help. I know where to get the 'chrome' strips for the roof...it is the panels that I need. My interior guy threw out the originals (lived and learned from that mistake!) and the ones he made are ill fitting at best. So, help me make my Buick Estate wagon beautiful again.